The next day cream the starter with the water for the recipe, then add in the oil and cherry puree. Lightly dust your counter or work space with flour and scrape the dough out. With lightly floured hands, give the dough a stretch and fold and then flatten it out into a rectangle. Spread as much of the choped pecans as possible over the top of the dough, then give it a fold or two to incorporate them. Once the pecans are incorporated put the pitted cherries on the top of the dough and do two more sets of gentle stretch and folds to incorporate the cherries. 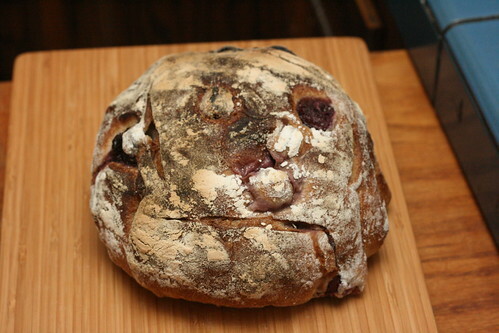 The cherries were really pretty easy to mix into the dough compared to pear pieces, even with the pitting making them moist they didn’t destroy the dough. Flavor wise, they went quite well with the pecans. 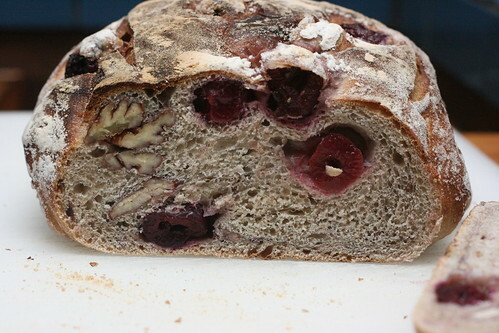 And it really feels almost luxurious eating a slice of this bread with a couple of big cherry pieces in it. It can make it a bit unwieldy, as the slices are unbalced by the weight. But it is definitely worth it… This one also kept moist quite well, better than the satsuma bread though not quite as well as the pear bread. Now hopefully next week will be a bit more normal, with no sickness! I missed last week because I was never able to repost this with the rest of the info, so I deleted the old post and have a new version for YeastSpotting this week. That bread looks delicious. I like the combination of cherries and pecans, the flavors are complimentary. You should think so 😉 Since you liked it when you had it! I love cherries. This is a bread after my own heart! !